GOP birther polls: Donald Trump doesn't denounce "Obama is Muslim" Town Hall questioner because that's his base. 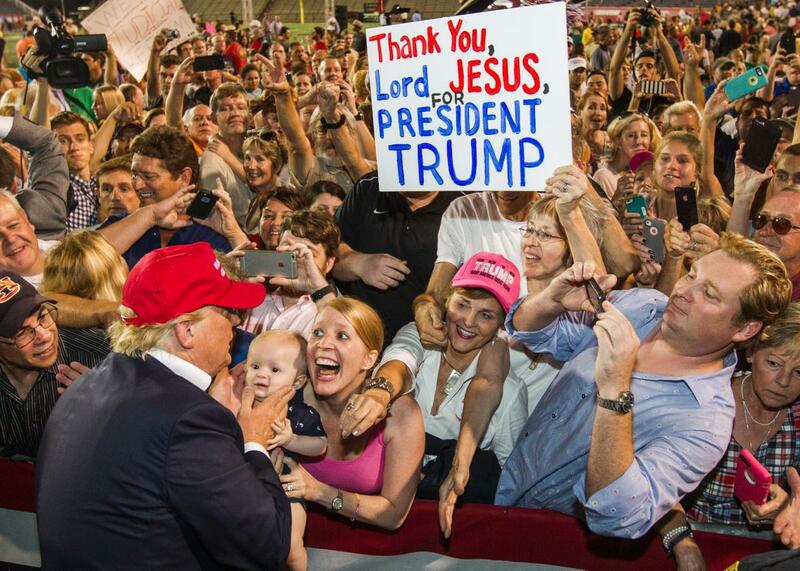 Republican presidential candidate Donald Trump greets supporters after his rally at Ladd-Peebles Stadium on August 21, 2015 in Mobile, Alabama. Clinton and Sanders were quick to criticize the response of Trump, who has maintained a steady lead in the Republican primary field in national polls for weeks. Let’s stop the racism. Let’s stop the xenophobia. Democratic National Committee Chairwoman Debbie Wasserman Schultz also released a statement calling on Republicans to denounce the comments from Trump. In comments reported by the Post, Sen. Rand Paul (R-Ky.), also a presidential candidate, said he’s “never heard of anything like camps” for terrorists thriving in the United States while the government paid no attention. Denouncing Trump or even the questioner might not actually be all that helpful, though, in a primary where polls have consistently shown that large portions of the GOP electorate still cling to the myth that Obama is foreign-born and not Constitutionally able to be president. Among Trump voters those numbers were even starker with 66 percent believing Obama is a Muslim and 61 percent saying they thought he wasn’t born in the United States. The PPP numbers are supported by a recent Des Moines Register/Bloomberg Politics poll of Iowa Republican voters publicized earlier this month in which 42 percent of respondents said Obama was born in the United States, and the vast majority said that either he was not (35 percent) or they did not know (24 percent). The numbers are also consistent with polling from last year by YouGov that showed only 34 percent of Republicans were certain the president was American-born and from 2011 when a majority of Republican voters surveyed by PPP said they believed he was born in another country. Trump himself re-upped his “Birther” credentials in July, telling CNN’s Anderson Cooper “I don’t know. I really don’t know” where the president was born. Trump also played a key role in pushing the “Birther” narrative that eventually led to the president having his long-form birth certificate released and then, shortly thereafter, mocking Trump for his conspiracy theory at the 2011 White House Correspondents’ Association dinner. The latest episode is further evidence that Trump has built a thus far successful campaign on a strategy of cultivating a key and not insignificant part of the Republican primary base that buys into a racist theory about President Obama’s origins.